Treat Your Feet To An Unprecedented Spa Soaking Experience! Looking for a home spa tub to relieve your aching feet after an exhausting day? In search of a professional foot soaking basin for treating corns, calluses or the athlete's foot? We are offering you a large, spacious and ULTRA sturdy pedicure spa foot tub that will make your foot treatment a comfortable & most enjoyable task! Here's How You Will Detox, Massage & Revitalize Your Feet, To Feel Relaxed & Rejuvenated! The long hours you spend standing on your feet cause stabbing pains in your feet and ankles. And your workout training, running or dancing sessions leave your feet tired, with dry, dehydrated skin and stubborn corns on the toenails. This large spa soak foot tub is designed to offer your feet pro standard treatment that will leave them relieved, baby soft and free of calluses, corns and inflammations. Just fill it with your fragrant essential oils, Epsom salts or the enhancer of your choice and get ready for an unforgettable foot massaging, detox or relaxing experience! Get A Foot Bathing Tub That Stands Out! Great For Your Home & Beauty Salon! Our foot soaking tub is a MUST-HAVE pedicure accessory for home or your beauty salon. It is ideal for athletes, travelers, dancers and professionals who stand on their feet long hours. 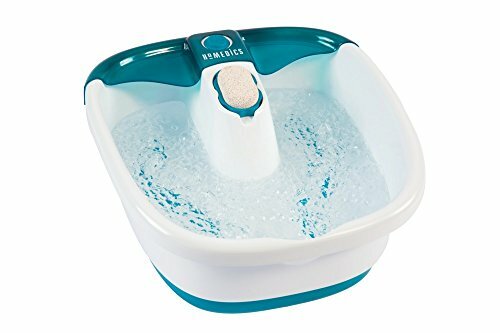 A LUXURIOUSLY RELAXING FOOT SOAK - Kick off your heels, shoes, work boots or whatever you're wearing on your feet and relax with this soothing foot massager basin from FineVine! Let the stresses and tensions of the day melt away as your feet are soothingly massaged and sublimely soaked in hot water - providing therapeutic stimulation for ankles, feet, and toes. PROFESSIONAL SALON & SPA TREATMENT AT HOME - You don't have to spend a bunch of money for expensive spa days when you can treat yourself from the comfort of home! Salons and professionals in the field recommend FineVine's extra large size basin for pre-soaking before pedicures and giving your skin a salon-worthy treatment session. REMOVE DEAD SKIN, CORNS & CALLUSES - Anyone who spends a lot of time on their feet knows the struggle of stubborn corns, calluses and other dry & irritated skin afflictions. Heal and pamper your feet from heel to toe with Epsom salts, essential oils, bath bombs or our own therapeutic tea tree oil foot soak (ASIN: B076L558R3)! ALLEVIATE ACHES AND PAINS - Our basin is professionally designed with raised dots and rounded arch supports strategically placed on the bottom for maximum massage therapy potential. Treat sore feet, bunions, plantar fasciitis, metatarsalgia, tendonitis, twisted ankles, arthritic toes & joints and other foot and ankle ailments. SUPERIOR STRONG & STURDY DESIGN - Our industrial strength foot basin is engineered with extra high walls and heavy duty plastic so it stays put at your feet without rocking and wobbling. 7 high walls let you start with a few inches of hot water and then continue to add more and keep soaking for longer even as the water cools down. Treat your feet to a relaxing foot bath with HoMedics Bubble Mate Foot Spa that will soothe and rejuvenate tired and overworked feet. The heat maintenance heats up water in minutes and maintains a consistent temperature. The foot spa features a removable pumice stone for the ultimate foot spa experience. The footbath was designed with raised nodes that soothes your feet. It also includes toe-touch control and a splash guard for convenience and ease of use. HoMedics is about creating a healthy home environment that helps you relax your body, de-stress, and simplify your life. Since our beginnings in 1987, HoMedics has created, innovated, and refined a remarkable line of personal wellness products to become the recognized #1 Brand in Massage. Our products combine our advancements in the field of massage with modern technology to create a rewarding, satisfying massage solution that puts you totally in control, and totally relieved of stress and aches. 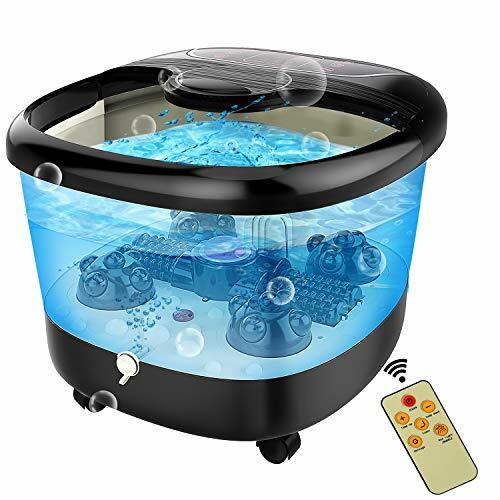 REJUVENATES OVERWORKED FEET: Treat your feet after a long day of work with this Bubble Mate Foot Spa. The massage water jets and raised nodes work to revive your feet by gently massaging and soothing your tired, overworked feet. MAINTAINS WARM WATER: Don't worry about waiting for your water to reach the right temperature. The foot spa can transform cold water into warmer water in just minutes. The heat maintenance helps maintain a warm water temperature throughout the footbath. SPLASH PROOF: The foot spa was designed with an integrated splash guard that helps prevent splashing and spills. This makes it easy to carry your foot spa without worrying about spilling the water, for a mess free experience. 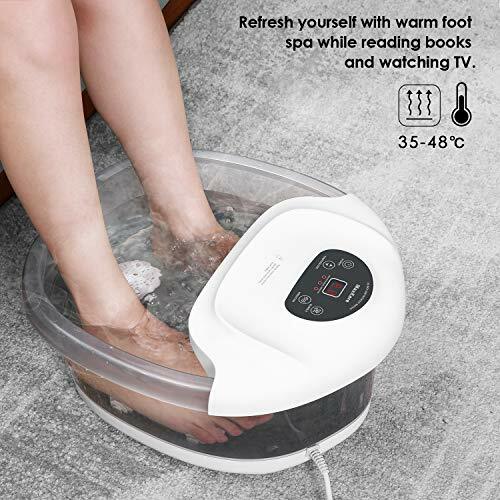 TOE-TOUCH CONTROL: The foot spa was designed with a convenient toe-touch control that allows you to adjust the jets and temperature with your toes, without having to reach down to adjust them. The foot spas includes a removable pumice stone. HOMEDICS: HoMedics is about creating a healthy home environment that helps you relax your body, de-stress, and simplify your life. Treat your feet to a massage and spa experience at home! 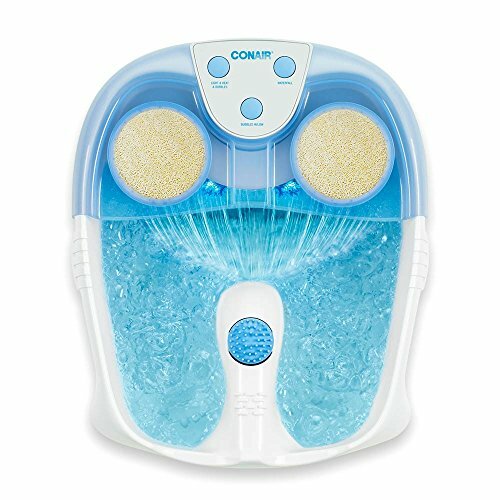 The Conair Foot Spa / Pedicure Spa with soothing foot massage vibration comforts your feet in warm relaxation. The toe-touch control on this foot spa makes it easy to activate massage intensity. The foot massage attachment and vibrating nodes in the foot spa provide extra foot massage action for a more deep, full foot massage. With this foot bath, it s easy to take care of one of the hardest working parts of your body. The deep reservoir allows you to fully immerse your feet, massaging both the top and bottom of your feet. Whether you want to soak in cool, warm or hot water, this foot spa is especially designed to maintain the temperature you choose. 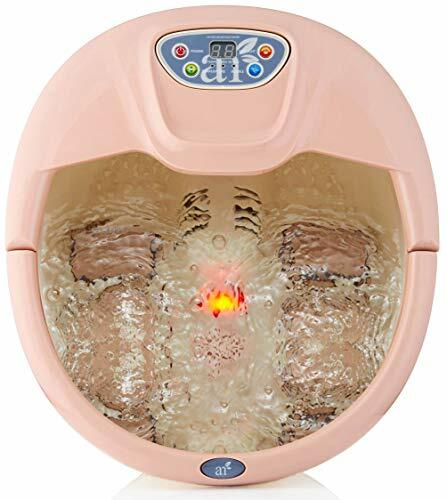 The textured bottom massages feet as you soak, and the vibrating foot massaging nodes add more massage intensity for a deep penetrating foot spa massage. With the Conair Foot Spa / Pedicure Spa with Soothing Vibration Massage, your feet will always be ready for rest and relaxation. A restful foot bath can provide well-earned stress relief with pampering and rejuvenating properties. This pedicure foot spa gives you a true, home spa experience. Remove dead skin, exfoliator, callus, hard cocoon, crack, glial hyperplasia etc, to keep the skin smooth. 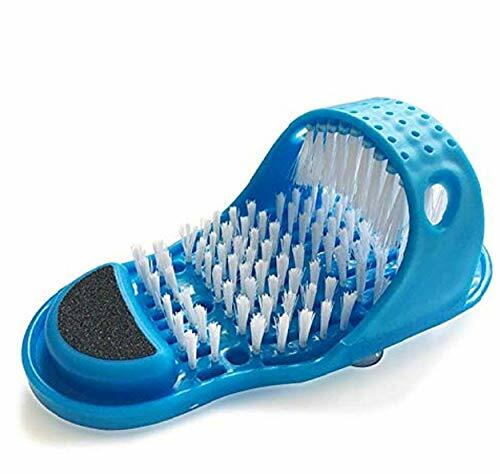 The Foot Scrubber with more than 1000 bristles provides a deep and thorough cleaning of the feet and in between toes.kin, exfoliator, callus, hard cocoon, crack, glial hyperplasia etc, to keep the skin smooth. The massager slipper is used to clean and message your feet from heel to toe,giving you clean and smooth feet. If the bristles tilt after use, please soak it in hot water for 3 minutes and then dry it to recover. If the ground is not smooth or there is a lot of soap foam, the suction force of the suction cups may be weakened. This is an inevitable common problem for all suction cups. However, it also can clean well by gently pressed with the other foot to fixed. When the suction cups firmly grasp the smooth surface, you need to lift it off the surface with its heel, please do not directly pull up the upper to avoid breake. This extra large foot soak bath tub by Milliard is the easy and affordable way to treat yourself to a bit of relaxation and pampering at the end of a busy day. Just add some sumptuous bubbles, tea tree oil or epsom salt, and feel those aches and pains dissolve as you soak! CLICK ADD TO CART NOW and experience a superior soak with Milliard! TREAT YOUR FEET & SOAK AWAY YOUR DAY - This extra large foot soak bath tub by Milliard is the easy and affordable way to treat yourself to a bit of relaxation and pampering at the end of a busy day. Just add some sumptuous bubbles, tea tree oil or epsom salt, and feel those aches and pains dissolve as you soak! 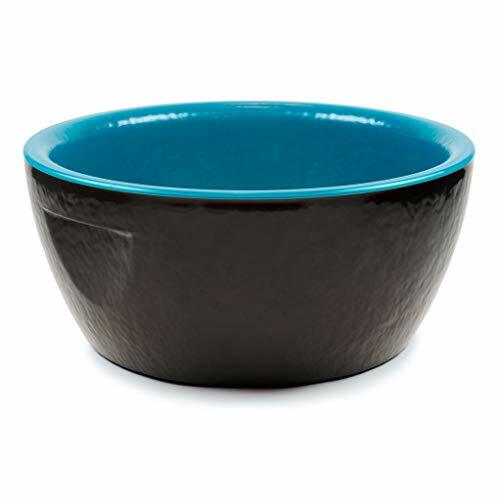 EXTRA LARGE TUB FITS UP TO A MEN'S SIZE 12 - This superior quality pedicure spa bowl is bigger than any other brand, making it a one-size-fits-all foot soaking tub for the whole family! The inner measurements of this foot basin are a wide and roomy 12.5 x 10.5 x 7 inches, and will fit any size of feet, up to a men's size 12. 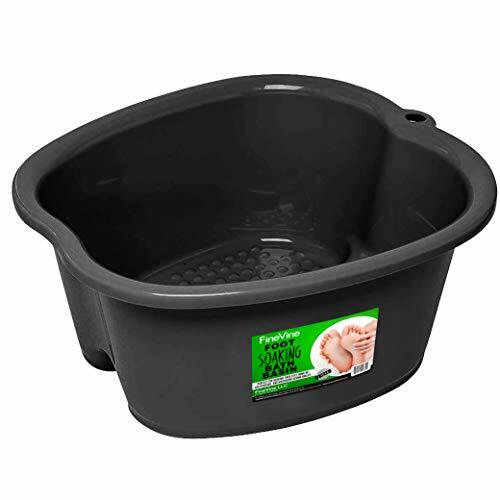 STRONG, STURDY & BUILT TO LAST - This massaging footbath bucket for sore feet is designed and built to give you endless nights of relaxation and divine foot soaking! 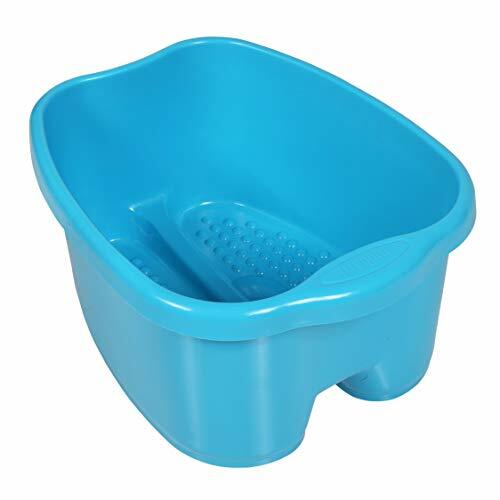 It's super easy to fill and empty, and is much more affordable and easier to store than an electric foot soaker. It makes the best gift for the holidays, so why not treat someone special to a bit of spa-style pampering? 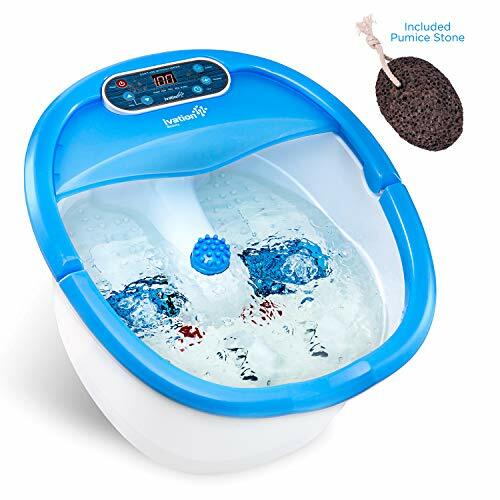 BUILT-IN FOOT MASSAGER - The raised bumps on the base of this big foot bath tub work to effectively massage your tired and achy feet while they soak, relieving you of any aches and pains and making your stressful day evaporate in minutes. It also works effectively to clean and soothe any toe nail fungus, and includes a convenient carry handle for foot soaks on the go. A foot spa is a great way to help relax yourself after a day filled with stress and fatigue, for it accelerates the process of metabolism, which is beneficial to your entire body. Simply fill the MaxKare spa bath massager with water, customize your ideal spa treatment, and then enjoy yourself with the relaxing comfort brought through bubbling warm water. The restorative spa helps alleviate stress and enhance well-being, making you believe that a day's hard work is worthwhile and sleep better at night. The diameter of the foot spa is 13.7 In, suitable for foot size up to men size 15. 1.The LCD screen clearly displays the set temperature and working modes. 2.The front curve of the product helps prevent water from splashing while poured out. 3.The storage case and massage rollers are detachable. 4.The cable length of the power cable is 150cm / 69in. 5.The product features electric leakage protecting for safer user experience. 1.Please do not use it without water. 2.Please keep the water volume between maximum line and minimum line. 3.Please keep the control panel away from water. Intelligent Temperature Control Set your favorable temperature (between 95 and 118 /35 -48 ) when you start the foot massager and the spa massager will heat the water up to the setted temperature, which can be maintained through usage without the need to add any hot water, ensuring you with a stable warm foot spa. Massager & Removable Rollers 4 removable massaging rollers provide massage on your feet while and acu-nodes on the bottom well apply pressure to accupoints on the soles to effectively reinvigorate you with added comfort. And it can be easily to remove it if you dont need the massaging rollers. Please kindly be noted that the rollers are not motorized ones, you need to move your feet yourself to enjoy the benefits of the rollers. Fashionable and Ergonomic The foot spa is fashionable and elegant with transparent design. The ergonomic outline well fits feet and helps prevent water from splashing. And non-slip rubber footstands maintain the stability of salon foot massager while in use. 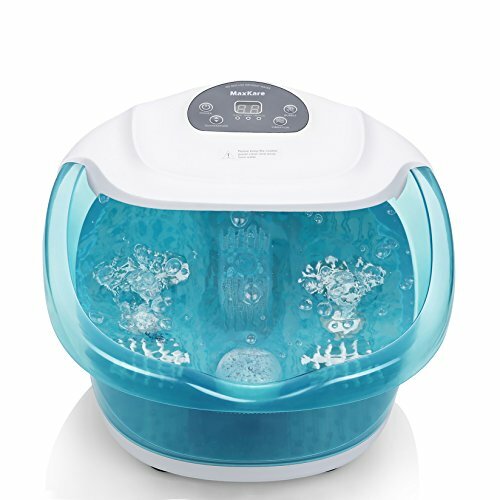 A small removable case is set in the massager inside which spa materials like bath epson salts could be put for a better foot spa comparable to an authentic one, totally relaxing you and soothing your mind. 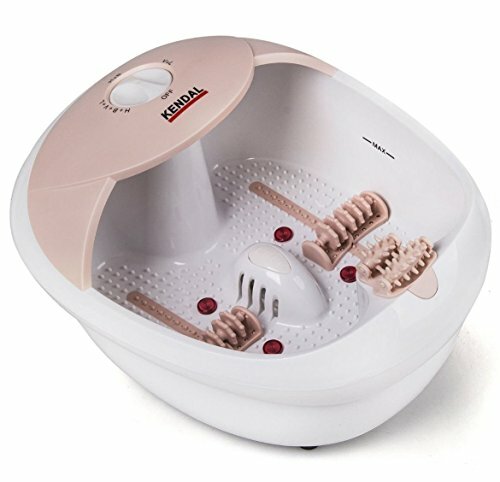 3 in 1 Foot Spa This fabulous foot spa bath is 3 in 1. Includes heating function for a warm foot spa and relieves fatigue, calming bubbles that truly pamper your feet. Also, intense vibrations to melt away stress. The bubbles reduce pressure while providing a massage. The 3 fuctions can work individually or all at once. At 13.7 diameter it even fits mens feet up to size 15. Rated Voltage 120V. Power Rating 500W. Rated Frequency 60Hz. Roomy and relaxing for a true spa experience. Safety First & Customer Priority - FDA certification certifies quality ensure your safety. All the foot spa massagers are on strict inspection beforepackaging.If you receive a product with water signs inside,this is a sign of factory inspection, which is a normalphenomenon. For any quality-related issues, please feel free to contact us, and a satisfying solution will be provided in 24 hours. For the brave men and women who work tirelessly on their feet all day long, you can kick back and receive a relaxing spa retreat that helps unwind your body and soul, and recover from the hectic life of the daily grind. Belmint knows what you really need for soothing your tired muscles and even more, enjoy every moment as you feel great relief from tensions, swells, and stiff. 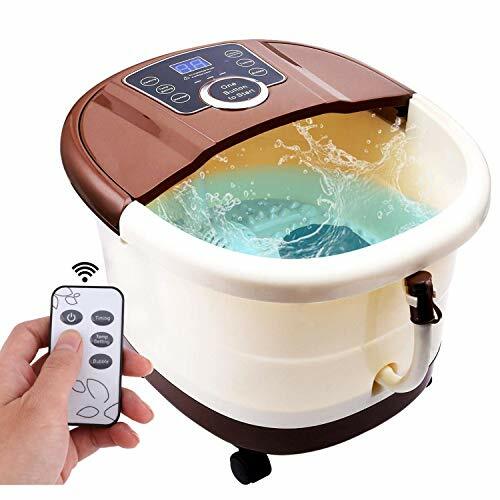 Our Spa Foot Bath with Heat is a truly pampering appliance to have around as it is integrated with all the best features of acupressure, shiatsu, heat, hydrotherapy to revitalize your feet and improve your overall body condition. With just the touch of a button, our multifunctional foot washer massager spa delivers a relaxing massage, bubble bliss and thermotherapy to your achy soles, heel, and toes. The multiple water jets create thousands of oxygenated bubbles to relieve pressure, athletes foot, burning sensation, plantar fasciitis, joint, and ligament pain. The integrated heat function along the bubble feature, you can benefit of improved blood flow and circulation as this may soften old calluses and hard areas of your feet so you can just easily cleanse dead skin and calluses on your feet and feel them like brand new. Specifications: User-Friendly LCD screen for easy navigation Timing massage: up to 60 minutes Features 3 different massage modes Equipped with drain pipe for easy draining Spa bubbles massage Heating function up to 118F Convenient wheels for easy movement Save costly spa services and enjoy unconditional foot soak tub massage from home with Belmint Foot Soaking Tub. Dimensions: 16.5" x 14.9" x 9.2"
Weighs in at 6.7 lbs. Save a ton on professional spa services! Pamper your feet with a rejuvenating massage and spa experience at home! 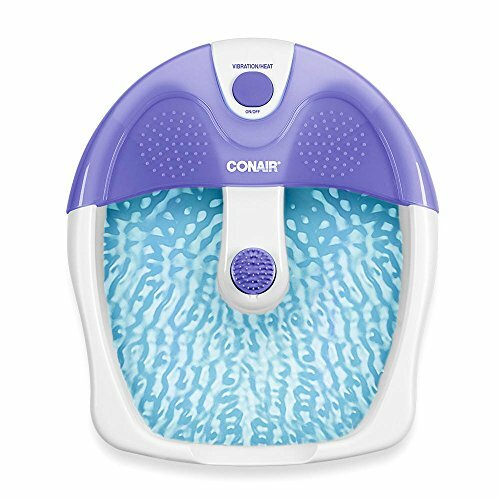 The Conair Active Life Waterfall Foot Spa comforts your feet in warm relaxation. Specially designed for active lifestyles, the flowing waterfall gently massages the top of the feet while the massaging foot rollers soothe the soles. Exfoliating loofah disks help soften skin and provide a rejuvenating massage, while LED lights showcase massage bubble action with heat to ensure water stays warm. 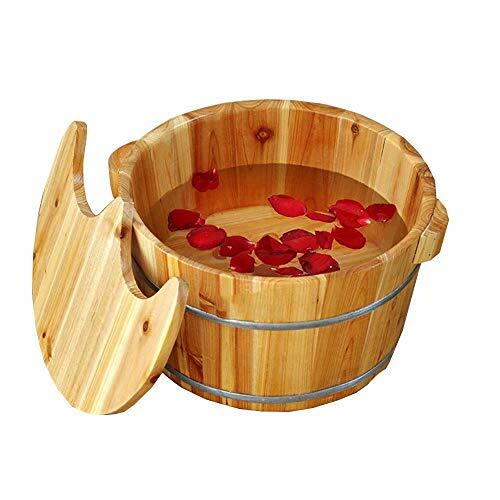 With this foot bath tub, it s easy to take good care of one of the hardest working parts of your body! Most of us are on our feet a lot! That s a lot of stress and strain on a daily basis. Compound that with activity and how much love do you give your feet? With each foot s 26 bones, 20-plus muscles and over 100 ligaments, it s no wonder that happy feet can affect your overall well-being. 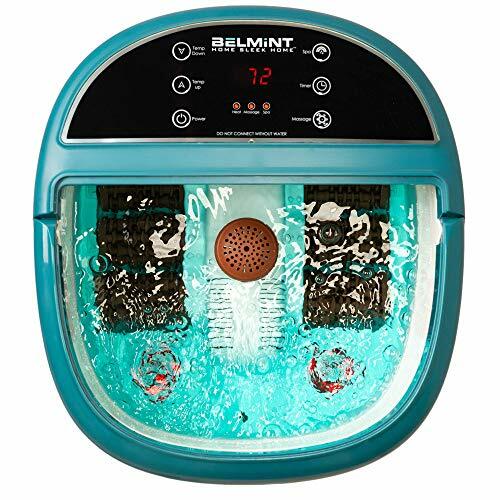 The toe-touch push buttons on this pedicure foot spa make it easy to control bubbles, waterfall feature and temperature for a customized experience every time. This foot massager includes 3 attachments: a pumice stone to gently exfoliate skin for smooth feet, a scrub brush to gently clean feet and a soft-touch massager to relax achy, sore feet. Whether you want to soak in cool, warm or hot water, this spa is especially designed to maintain the temperature you choose. Water jets propel water over and around your foot, providing a massaging effect that helps your muscles relax. The massaging foot spa also has a waterfall feature which gently pours water over the top of your feet for utter relaxation. With the Conair Active Life Waterfall Foot Spa with Lights and Bubbles, your feet will always be pampered and revitalized. This footbath will not keep the water warm; you must put warm water into the footbath and expect it to cool off after around 10 minutes. We do not say anywhere on the detail page that it will hear and/or keep water warm. Keep the water at 100 to 118 degrees fahrenheit to avoid burning your skin. Adjustable Temperature with PTC Heater - Water temperature can be set from 35 to 48 (95 F~118 F), speedly heating then maintaining a constant temperature. Heat can not only enhance therapeutic effect, but also help with swelling, throbbing, redness. PTC Heater with more secure multi-insulation protection. Safe and secure double overheating protection. Adding infrared red light to sterilize your feet. A foot spa is a great way to help relax yourself after a day filled with stress and fatigue, for it accelerates the process of metabolism, which is beneficial to your entire body. Simply fill the MaxKare spa bath massager with water, customize your ideal spa treatment, and then enjoy yourself with the relaxing comfort brought through bubbling warm water. The restorative spa helps alleviate stress and enhance well-being, making you believe that a day's hard work is worthwhile and sleep better at night. 3 in 1 Foot Spa This fabulous foot spa bath is 3 in 1. Includes heating function for a warm foot spa and relieves fatigue, calming bubbles that truly pamper your feet. Also, intense vibrations to melt away stress. The bubbles reduce pressure while providing a massage. The 3 fuctions can work individually or all at once. At 13.7 diameter it even fits mens feet up to size 15. Roomy and relaxing for a true spa experience. All-in-one: heating therapy, oxygen bubbles massage, high-frequency vibration massage. Whole machine (rather than just parts) with ETL certificate. With electric leakage protection - Safest foot spa. Big enough for both women and men. Body made of high-quality plastic -- high temperature resistance and aging resistance. Beautiful and elegant. Good for personal use and as gifts for others. 110V, 60HZ, 380 watts, UL listed. PRODUCT DESCRIPTION: We love our foot soak bath and enjoy adding simple enhancers to * Help alleviate foot bacteria which causes odors * Moisturize feet * Address Inflammation * Administer essential oils for relaxation * Relieve achy feet or * Regulate body temperature to warm up on a chilly night or cool down on a hot day Plus foot soaks are a relaxing experience at the end of the a long day. For whatever is your reason, rest assured that this foot soak bath will do its job. Why make things complicated? Sometimes the simplest functional tool is best. EXTRA LARGE ROOMY FOOT TUB - This tub will comfortably fit a pair man's size 14 wide feet (Don't worry if it's to big, there will be more room to massage your feet!) . The base dimensions are 11.5" long and 10.5" wide. At 7" tall, this tub is just the right height to cover your feet and ankles too. 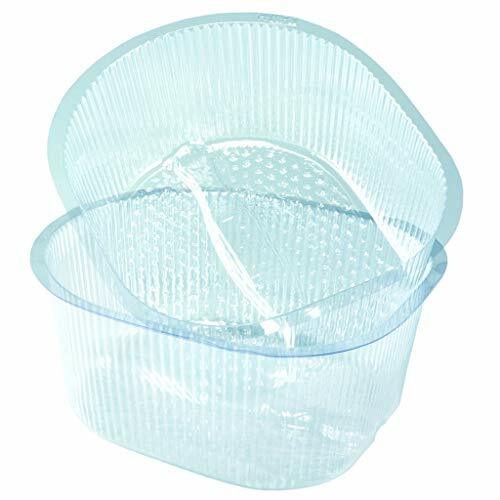 STURDY DESIGN - Handles break and thin plastic wobbles when filled with water. This soaker is built to last with thick sturdy plastic that won't wobble. EXTRA FEATURES MAKE THIS TUB THE RIGHT CHOICE - With this tub, you get built in foot massager dots, built in arches, water drain spout and volume markers. RELIABLE FOOT SOAKING TUB - No electronics to break or loud annoying sounds as you relax. Just add hot water and enjoy a 20 minute soak. Add additional hot water if necessary. Simple, reliable. IT'S PERFECT FOR - Relaxing after a long day with some Epsom Salt, Essential Oil Foot Soak Recipes, or a multitude of enhancers. Soaking your feet is often doctor recommended if you have toenail fungus, ingrown nails or athlete's foot. It can also help with softening nails before trimming or soothing foot painful corns. - Suit for Bathing and leisure places, beauty and body centers, foot massage places, hotels, hotels, families, etc. - Prevent cross infection and eliminate worries. 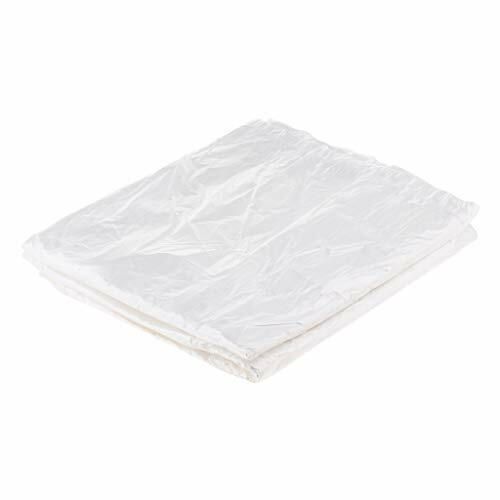 - Safe and convenient to use, reduce pollution, easy to clean and maintain supplies. 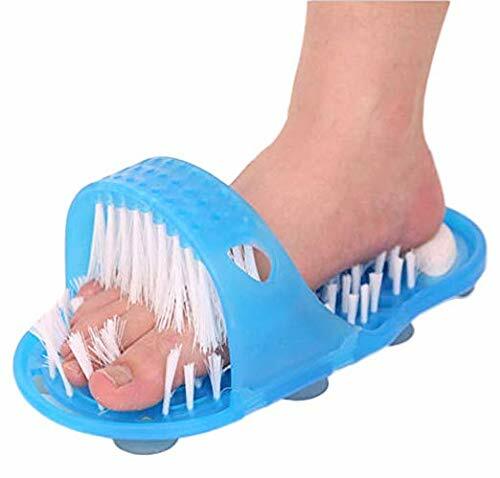 - Good for use for foot spa or any other purpose for a hygienic. - A package of about 90 pieces. 1.Please allow 1~3 cm error due to manual measurement, thanks. 2.Due to the difference between different monitors, the picture may not reflect the actual color of the item. Please understand, thank you. Good for use for foot spa or any other purpose for a hygienic. Suit for Bathing and leisure places, beauty and body centers, foot massage places, hotels, hotels, families, etc. Prevent cross infection and eliminate worries. Safe and convenient to use, reduce pollution, easy to clean and maintain supplies. PTC Heater & Infrared Light Sterilize - PTC Heater with safe and secure multi-insulation protection and double overheating protection. Speedly heating in minutes then maintaining a constant temperature. Heat can not only enhance therapeutic effect, but also help with swelling, throbbing, redness. Adding infrared red light to sterilize your feet. If you have any questions, please email us. We will do our best to help you. Keraiz Bathroom Shower Foot Scrubber Feet Exfoliate Cleaner Bristle Slipper No Bending Foot Massager Stick with Suction Cup. Removes dead skin, Exfoliator, Callus, Hard Cocoon, Crack, Glial hyperplasia etc to keep the skin smooth. Improves Blood circulation and gives scrubbing and massaging effect around the feet and gives relaxation to the feet muscles. Designed for use in your bathtub or shower. Features the nine suction cups for added safety. Suction cups at the bottom adhere to floor and hold it in place. A perfect foot care Spa At home. Feature: You will love our foot soak bath! There is no better way to end your day! For whatever is your reason, rest assured that this foot soak bath will do its job. Why make things complicated? Sometimes the simplest functional tool is best. PREMIUM MATERIAL:This soaker is built to last! Thick solid plastic that doesn't wobble when filled with water. No attachments, like a handle, that will break off. SIZE:Large roomy foot tub at 16*14*6- This tub will comfortably fit a pair man's size 11 wide feet. At 7 tall, this tub is just the right height to cover your feet and ankles too. FEATURE:Relaxing after a long day with some Epsom Salt, Essential Oil Foot Soak Recipes, or a multitude of enhancers. Soaking your feet is often doctor recommended if you have toenail fungus, ingrown nails or athlete's foot. It can also help with softening nails before trimming or soothing foot painful corns. 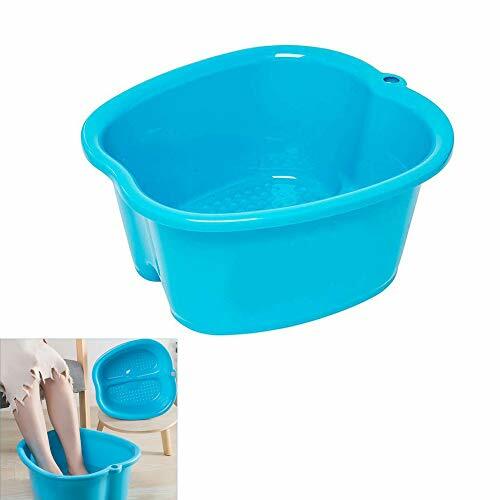 DESIGN:Bottom of bucket features bumps which allows better soaking of the sole.Relaxing your feet and ankles with this foot spa bucket. RELIABLE FOOT SOAKING TUB:No electronics to break or loud annoying sounds as you relax. Just add hot water and enjoy a 20 minute soak. It's that simple! 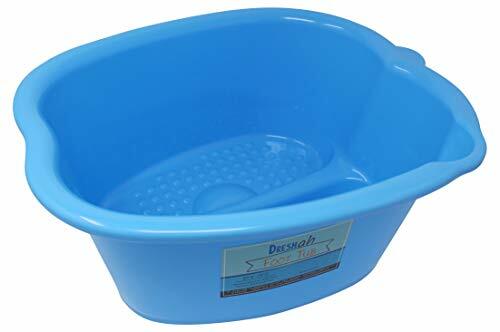 Foot Soaking Bath Basin Large Size for Soaking Feet Pedicure and Massager Tub for At Home Spa Treatment Relax and Add Hot Water,Epsom Salts Blue 14.9" 7"